Click Lights in the Tables submenu of the Tools menu to bring up the Light Table, and click the Add... button at the bottom of the Light Table pane to bring up the Add Light pane. Select a System Connection if your layout is connected to more than one system or to create an Internal Light. Next enter the Hardware Address of your new Light (often entered as a number, look at the Tooltip for accepted entry patterns per system). This is the address JMRI will send to your system when switching the Light. From this information, the program will make a System Name in the JMRI convention, appropriate for a Light in the selected System using the entered address. When you hover your mouse over the Hardware Address entry field, a tooltip will display accepted entry example (depending on availability). Some examples of valid System Names are: CL1004, and LL401 (entered as '401' here), assuming you have the hardware for the addressed digital output bits. Enter a User Name. Any string of characters that is different from the User Name of other Lights will be accepted, but it's wise to use a string that describes the intended use of the Light. Entry of a User Name is optional. If you wish to enter a Control for your new Light, click the Add Control button, and enter your choices into the Add Light Control pane which appears. You may enter as many Light Controls as desired. More information on Light Controls below. Each Light Control is displayed in the Light Control table on the Add Light and Edit Light pane. The Control Type is shown on the left, followed by a Description of the Control mechanism. These are followed by Edit and Delete buttons. Click Edit to bring up the Edit Light Control pane allowing changes to the control specification as described above. Click a Delete button to remove a Light Control. Next is the notes area of the Add Light pane. This is where instructions and error messages will appear as you create (or edit) a Light. Always check this area to see if things went as expected. Correct the error and click Create again. Click the Close button to dismiss the pane without creating any more Lights. Adding several new Lights at once is optional. If you only want to add one new Light, ignore the Add a sequential range check box and the Number of items: entry. 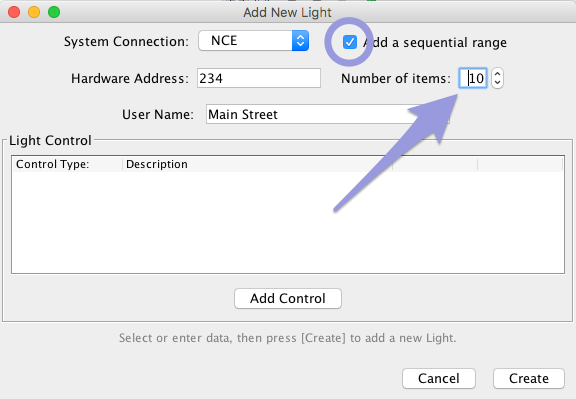 If you want to add several new Lights with sequential hardware addresses, check the Add a sequential range check box. When this box is checked, the Number of items: field is activated. Set the number of Lights you want to add. Enter other properties for the first Light, following the procedure above, and click the Create button. If any of the requested addresses are not available (previously assigned to a Light or a Turnout by the same address), a message will appear in the notes area, and no new Lights will be created. If everything checks out, the requested Lights will be created, and a message will appear in the notes area at the bottom of the pane. The addresses must be numerical -- only numbers are allowed in the hardware address. The addresses of the created Lights must be consecutive. All requested addresses must be available, i.e., not currently assigned to a Light or Turnout. If a User Name is entered, each of the created Lights after the first will have that User Name with ":1", ":2", etc. appended. Entered Light Control items and Variable Intensity items will be assigned to the first Light created, and not to subsequent Lights. These items may be added by manual Editing (see next paragraph). The System Name: of the Light is displayed at the top of the pane and cannot be changed once created. The User Name may be changed either here or by double clicking on it in the Light Table. The Light Control and notes areas are the same as above. After making changes to the Light information, click Update to change the selected Light. If there is any trouble, an error or warning message will be displayed in the notes area, and the update is stopped for you to correct the error and click Update again. If all is fine, the Light is changed and the Add/Edit Light pane is dismissed. Click Cancel to exit edit mode without changing the selected Light. If the Edit Light pane is dismissed (closed) while in edit mode, Cancel is automatically selected, and no changes are made to the selected Light. By Sensor - The Light will be turned ON when the Sensor changes to Active or Inactive, depending upon the choice made in the Sense for ON popup menu, and it will be turned OFF, when the Sensor reverses state. Specify the Sensor by entering its name (System Name or User Name) in the Sensor Name field. This option has a number of uses, including setting a fascia panel light to follow block occupancy. That is useful, for example, for monitoring train position in a hidden staging area. By Fast Clock - The Light will be turned ON when the Fast Clock reaches the time entered in Time On and will be turned OFF when the Fast Clock reaches the time entered in Time Off. The times are entered in "hh:mm" format, where "hh" is hours and "mm" is minutes for a 24-hour clock. 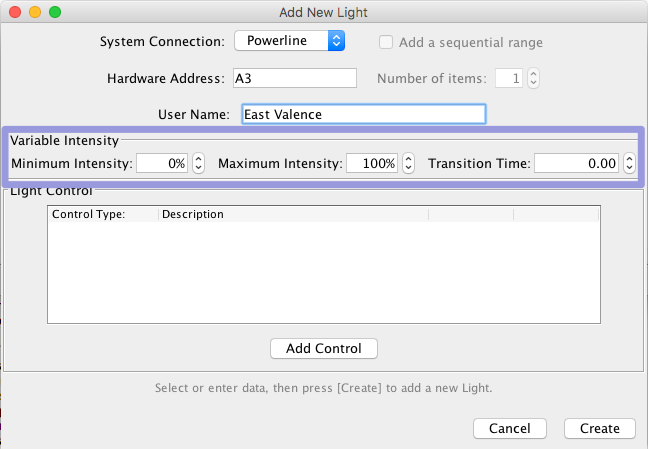 One use of this option is to turn on and off scenery lighting, street lights, house lights, etc. to simulate night time on the layout. By Turnout Status - The Light will be turned ON when the Turnout changes to Closed or Thrown, depending upon the choice made in the Status for ON popup menu, and it will be turned OFF, when the Turnout reverses its status. Specify the Turnout by entering its name (System Name or User Name) in the Turnout Name field. This option may be used to set a fascia panel light to follow the status of a Turnout. That is useful, for example, for monitoring the status of hidden turnouts. By Timed ON - The Light will be turned ON when the trigger sensor changes to active, and it will be turned OFF, when the specified time has elapsed. Specify the trigger Sensor by entering its name (System Name or User Name) in the Trigger Sensor Name field. Enter the time the Light is to remain on (in milliseconds) in the Duration ON field. This option has a number of uses, it was originally designed to turn on an electromagnetic decoupler in response to a fascia pushbutton, but it can also be used for other types of layout animation, for example, to control the ringing of a crossing bell when a train enters a block. By Two Sensors - The Light will be turned ON when the either of the two Sensors changes to Active or Inactive, depending upon the choice made in the Sense for ON popup menu, and it will be turned OFF, when both of the two Sensors are in the reverse state. Specify each Sensor by entering its name (System Name or User Name) in the Sensor Name field. The order of entry does not matter. This option has multiple uses, such as controlling crossing gates with point sensors that detect when a train passes. By placing two point sensors, one at each end of a bridge, a layout sound for a bridge rumble may be played while the train is traversing the bridge. After have set a Sensor or a Turnout as part of a Light Control, be very careful about changing the User Name of your Sensor or Turnout. A simple change of User Name could break your Light Control definitions. If you enter multiple Light Controls for the same Light, it is possible that the Light Controls might conflict or overlap with each other, producing strange results. The user is responsible for ensuring that Light Controls do not conflict. Systems like PowerLine, that support variable intensity lights also support lights with fixed intensity. If you are adding a Light with fixed intensity, i.e. an ON/OFF light, just leave the items in the Variable Intensity area as set. When editing a simple ON/OFF light on a system not supporting variable lights, the items in the Variable Intensity area are not displayed. The intensity of a Light is represented internally by the range from 0.0 to 1.0, with 1.0 being brightest. Intensity limits are entered as percentages, from 0 through 100, in the Minimum Intensity and Maximum Intensity boxes. Because the actual light hardware has only finite resolution, the intensity value is mapped to the nearest supported setting. Each Light has a Target Intensity property which can be set using a script or other code. Attempting to set the Target Intensity outside the Minimum Intensity to Maximum Intensity range will result in the Target Intensity being set to the relevant limit. Back to the Light Table help page.